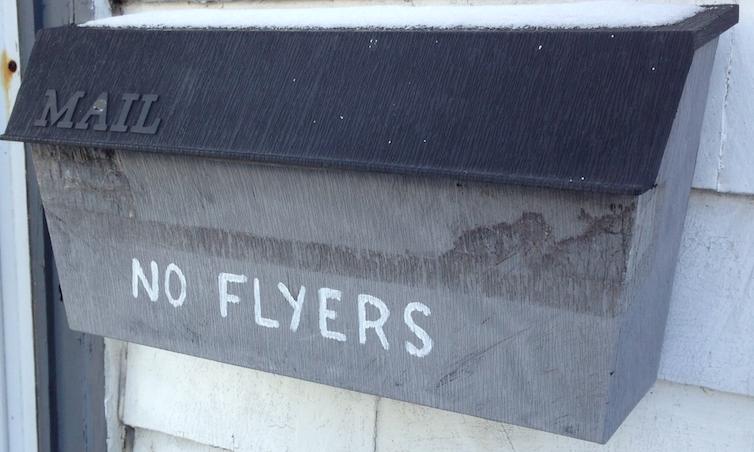 Environment committee moves forward with recommendation restricting junk mail deliveries at homes with a “No Flyers” sign. Halifax wants to install some real-life spam filters for unwanted flyer deliveries. On Thursday HRM's Environment and Sustainability committee approved a staff recommendation to strengthen regulations on how printed commercial advertisements can be distributed to the city's doorsteps. The motion—which still needs final approval from Regional Council—would create a new bylaw banning bagged commercial leaflets from being tossed onto the driveways of any homes displaying a “No Flyers” sign. “It gives teeth to what now is only industry guidelines,” said Middle/Upper Sackville–Beaver Bank–Lucasville councillor Lisa Blackburn, who's the latest in a long line of city councillors asking for staff reports on the nuisance product. Flyer distribution in Nova Scotia is regulated by a voluntary agreement signed by newspaper publishers, the Department of Environment and regional solid waste representatives. Distributors such as the Chronicle Herald are supposed to have an “opt-out” option for residents unhappy with the pink bags of soggy papers left at their doors every week. But in practice, city staff report residents routinely complain they continue receiving flyers even after opting-out. Council has asked several times over the past decade for staff to investigate an “opt-in” system for flyer delivery. Inevitably those reports dead-end with the conclusion that an outright ban on flyer delivery would infringe on freedom of expression as enshrined in the Canadian Charter. City councillor Shawn Cleary isn't buying it. While the Halifax West Armdale representative supported staff’s recommendation on Thursday, Cleary also suggested Canada’s free speech protections don’t universally apply to commercial advertisements. While an outright ban is—for now—out of the question, staff have more faith they can enact the sort of “reasonable restrictions” already passed in other Canadian municipalities. Ottawa approved a similar bylaw in 2003 that bans the delivery of unaddressed advertising circulars to any home displaying a “No Junk Mail” sign. Flyers in that city also need to be placed in a receptacle or hung on doorknobs, instead of tossed onto a property. Similarly, HRM staff will work with stakeholders like the Herald on a pilot project of “flyer boxes” in rural areas to replace bags being left at the end of long driveways. The daily newspaper is the largest distributor of flyers in the province. Ensuring that proper standards for the delivery of that product are adhered to is “important to the Herald to protect revenue and their reputation,” state HRM staff. Those concerns were of little interest to Cleary, however. A 2016 study by the Ecology Action Centre concluded homes that don’t receive flyers save roughly 25 lbs of paper per year.